New Verizon Droid Incredible | Flecks of... Gray? 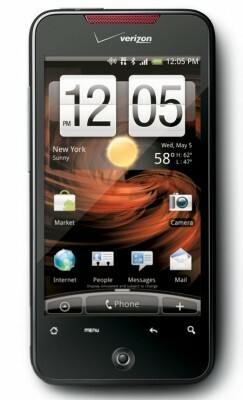 This week, I got my brand new Droid Incredible from Verizon and my jaw is slack in admiration. In getting this phone I’m making a major upgrade from my previous Razr phone to the brave new world of smartphones. It has integrated GPS tied right in to my Google Maps account (all my highlights are there! ), I hooked up my Google Apps (mennoboy.com) and GMail accounts in a few minutes and instantly my inbox, contacts and calendars were all filled up with their online bounty. My work account (Exchange based) took about the same amount of time and also works seamlessly, merging the contacts and calendars together and creating a new inbox for that mail. Also, there’s an application for my Yahoo IM account so I’m able to be available to my online work buddies whether I’m at home (with WiFi) or on the road (with 3G). Top that off with an 8M camera which is capable of taking some decent shots (here’s one of Grenz). Aside from this great core functionality, there are some other great apps which make the phone so capable, there’s a barcode scanner (to see if there’s a better price somewhere else), weather channel information, IMDb quick lookups, dropbox integration, mint.com personal finance, Google Earth, Google Sky, Google Voice, NES Emulators, FM Radio, and a DivX player (for my .avi type movies – no conversion needed – sweet! ).